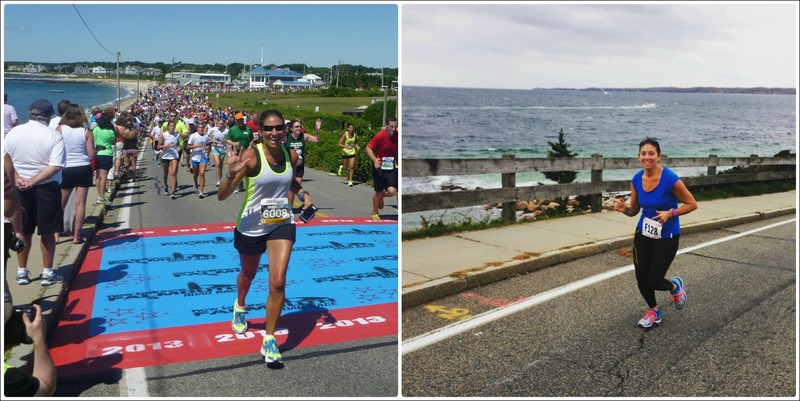 So if you’ve read any of my 3 Falmouth Road Race Recaps, you’ve probably noticed a theme – the Falmouth Road Race is HOT. And HUMID. Honesty, I was miserable and whiney for almost the entire race this August. 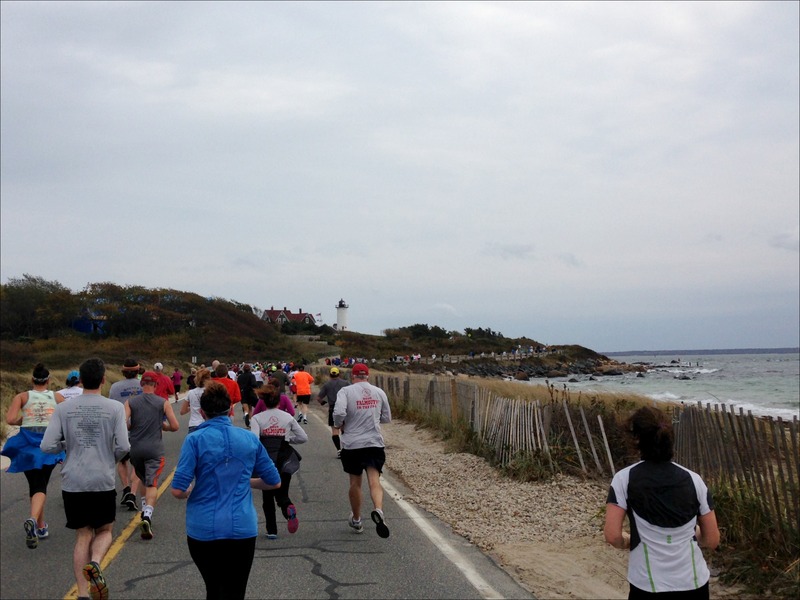 And while it is a wonderfully organized race (how they manage to get 14,000 people into little Woods Hole I’ll never know! ), the race can be a bit crowded. So, many locals are partial to a little secret called Falmouth in the Fall – same course, different weather and A LOT less people! Now if you want an idea of how “local” and old school this race is, there is no online race registration. And no in person race registration. You actually have to print out a form and MAIL, (not e-mail, real U.S. Postal Service mail!) it in! AND you have to include a self addressed stamped envelope for them to mail your bib back to you! 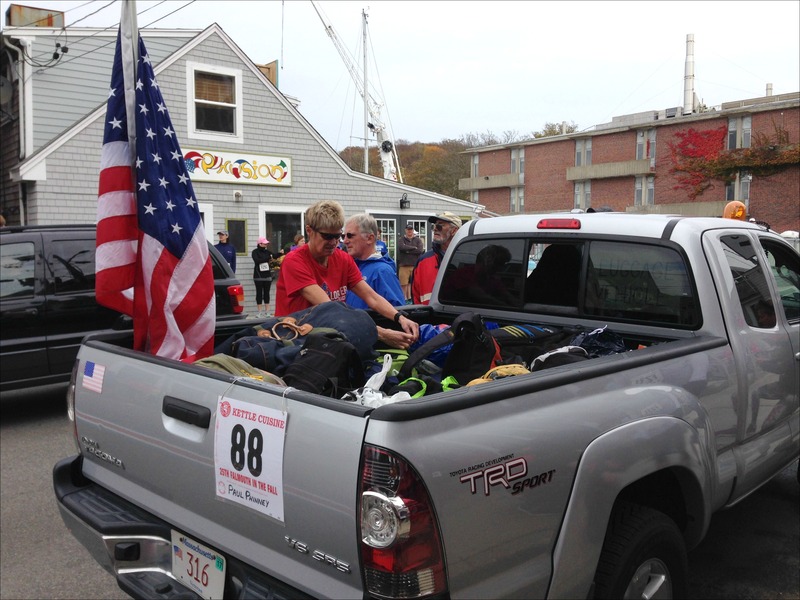 And this truck is not only the pace car…it’s “bag check”. Yup, toss your bag in the back of a truck, no name, no bib #, nothing. And at the end of the race, just root through the back of the truck and grab your bag (or any one that looks good I guess?) – crazy! Anyways, other than the size (which I think was under 300 people), the race logistics were very similar to the August Falmouth Road Race – we hopped on the provided school bus transportation and were in Woods Hole in no time. We met up with our friend Dave and hungout in the Martha’s Vineyard ferry terminal to stay warm. They played America the Beautiful at the start line and we were off! Since I’ve run the Falmouth Road Race 3 times before, the course was familiar, but boy, what a difference does 20 degrees and 30% humidity make! Being that I ran the Marine Corps Marathon a week ago and the Hartford Marathon 2 weeks before that I wasn’t really sure how my legs were going to react, so I was prepared to back off the pace and even walk if I needed to (you know, since I have the Wine & Dine Half Marathon next weekend!). Jason and I started off at a comfortable pace, but we slowly picked it up – it was actually amazing to run this beautiful course and be able to BREATHE! My one goal in this race was to RUN up the hill that’s right before the finish line. …so let me tell you, I charged up that hill! I crossed the finish line of this 7 mile race in 1:01:49, just under a 2 minute PR on this course for me. Like I said, what a difference 20 degrees makes! Also, looking back at my splits, I’m really happy with the way I ran this race, it was basically a perfect progression run with my splits decreasing from 9:07 to 8:24 over the 7 miles. After the finish line, while the Falmouth Road Race has a HUGE party on a baseball field with lots of snacks, Falmouth in the Fall has one little tent. But in this one little tent is CLAM CHOWDER! Yup, this is a quintessential New England race folks! 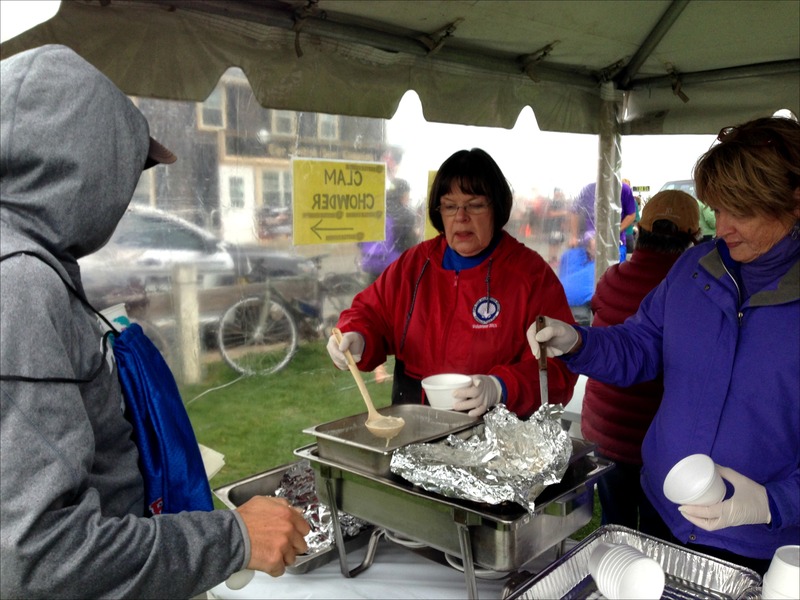 And who knew clam chowder is such a perfect post race snack?! 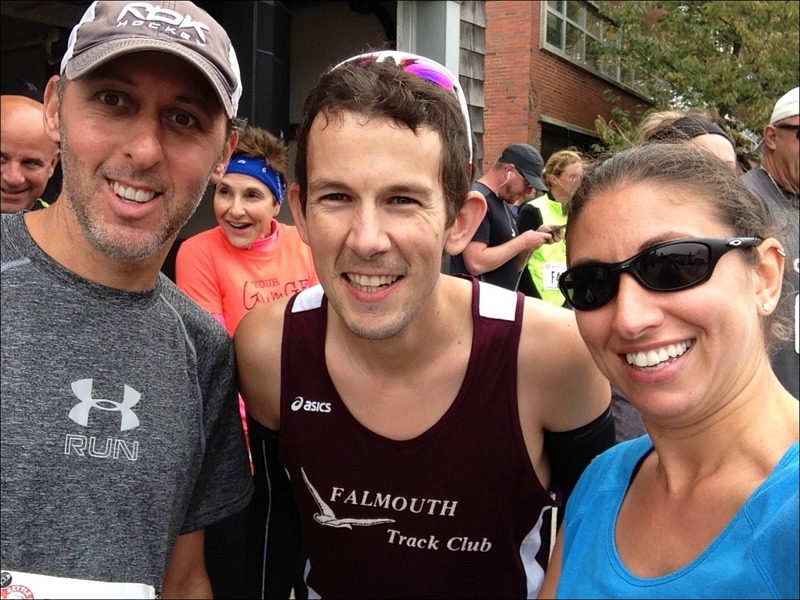 I have to be honest, when I crossed the finish line of the Falmouth Road Race this summer I said to Jason, “never again”. I just don’t do the heat and humidity well and I really didn’t enjoy the race, I think I’d rather volunteer at that one, but I can tell you that I’ll be back for Falmouth in the Fall! How much does weather affect your race choices? Is there a course you wish you could tackle in different weather? I love small local races and how casual people are. At one, Ben and I dropped our bags in an open area because that’s what everyone else was doing (also no bag tag, no volunteers, nothing). At another race, everyone dropped their car keys in a box (again with no tag or anything). I joked that if I wanted a car upgrade that race was the perfect place to do it. I prefer the heat. I don’t like to bundle up and I tend to run better than most people in the heat. I don’t mind sweating, I’m a runner. I can make the cold work for me though. There is less need to worry about hydration and I always wear a vest or jacket with a zipper so I can maintain a more consistent body temp. 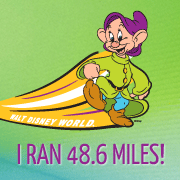 I ran in 41F last weekend and thought that was cold. 20F! Yikes. I like the old school races also. I think they tend to be smaller. As a race gets larger the logistics dictate a more formal process. Can you imagine handling 1,000 paper apps and then mailing out 1,000 bibs! Hmmmmmmmmmmm I think once I get faster (so, you know, never) I may have to do this fall version instead. It was beautiful but ugh! Summer death! Haha, I’m sure you would enjoy this one MUCH more than the August one! Great job Danielle. I would love to run a Falmouth race since I spent so much time there as a kid. This one looks perfect with both size and weather. If I could choose a race to run at a different time of year, it would be ROck ‘n ROll Virginia Beach. It is always ridiculously hot. Oh I would LOVE if you came to the Cape for a race one day! OMG clam chowder after a race could either be really awesome or really awful, haha! Great job! Haha, the chowder was SO good! 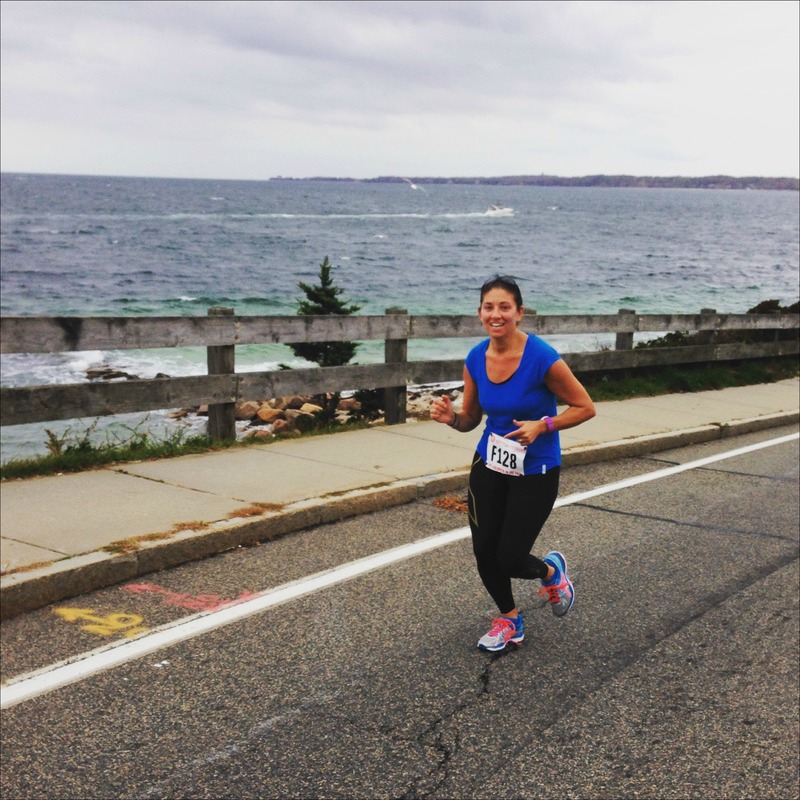 But yeah, before the race I was thinking, “do I really want chowder right after I run?? !” Apparently the answer was yes, I DO want chowder right after I run! Weather absolutely affects me. I have to be inside on awful summer days, otherwise I’ll melt. I sweat enough inside already. Cool weather is soooo much better for running. Yeah, I really struggle in the heat! I still always run outside thought since I don’t have access to a treadmill, I always think I’ll eventually adapt to it, but there’s just no adapting to humidity! Ugggh, I do NOT race in the summer for this very reason. 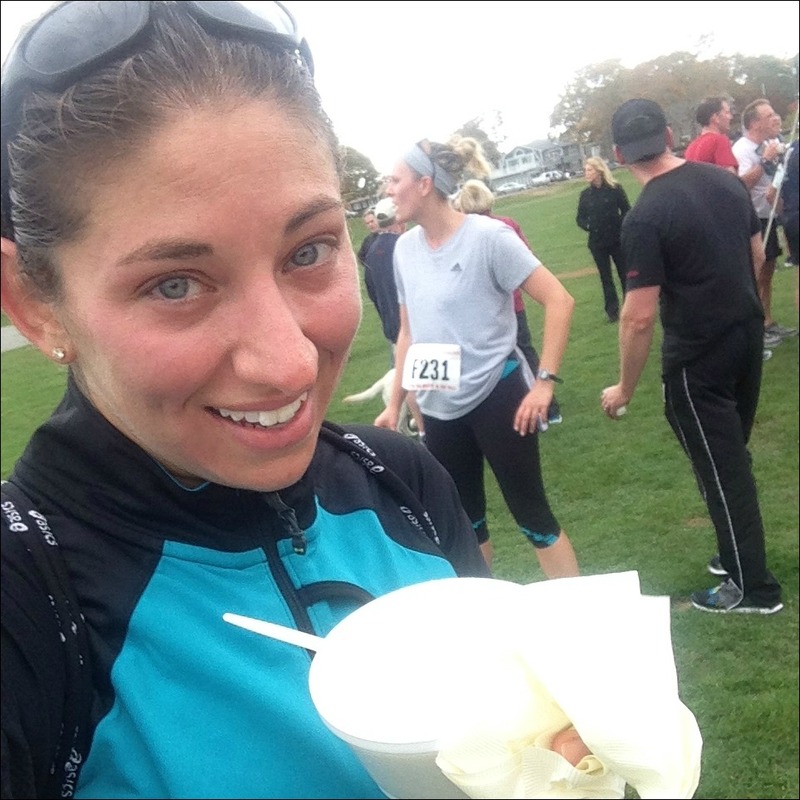 It was 65 during NYCM and I seriously felt SOOOO hot — so forget summer running, haha. Gorgeous views, though! Yeah, I have vowed no more summer races!